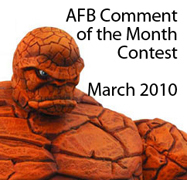 AFB goes Orange for the March Comment Contest - Bonus Chance for Facebook Followers! First off, thanks to everyone who commented on last month’s blog posts. Congratulations to “Prowl26” for being our winner! Mr. Prowl – – please get in touch with me – probably easiest to do so through the AFB Forum – just log in and message me (“Andy”). Once we hear from Prowl his choice of either DCUC Wave 12 Iron or the Secret Wars Thor & Enchantress Two-Pack will be on the way from Mike’s Comics N’ Stuff. 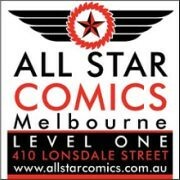 Now to March’s Contest: on offer are two great prizes, either the Marvel Select Thing or the Blackest Night Wave 3 Larfleeze figure. 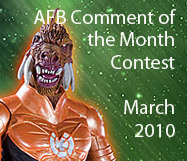 As a bonus to AFB's Facebook followers, one commenter AND one FB follower will be chosen for prizes this month! If you're not a follower of AFB on Facebook, become a fan now! right i'm ready to go with the commenting! Well done Prowl. Join us in the AFB Forum for a chat! Comment contest? I refuse to comment. thanks guys, I do not know what else to say really, I have been reading here for a few months and really like the site. Good luck to anyone getting into this months contest.